People across Britain were getting ready to give Donald Trump the welcome he deserves this week—a deafening howl of rage against him and his government. Trump is set to avoid London almost entirely—scared of the strength of feeling in Britain against the racism, sexism, bigotry and climate change denial he represents. But in every major city—and in many smaller towns—there will be protests. The major demo will be in London on Friday from 2pm. Cops have said they will turn out as many police on London’s streets as during the London riots of 2011. Some 6,000 officers are being deployed in London and another 4,000 are spread out over the different locations where Trump could go. Activists are targeting places Trump is supposed to be heading to. Protests were set to take place ­outside Blenheim Palace in Oxfordshire on Thursday evening and the prime minister’s country pile Chequers earlier on the Friday. 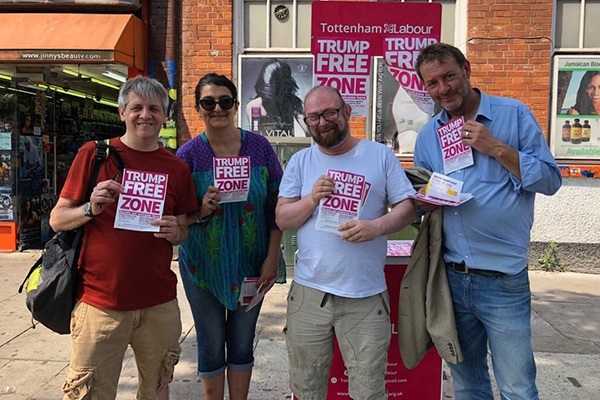 Oxford Stand Up To Trump activist Ian McKendrick spoke to Socialist Worker about how people have been building for the protests. “Theresa May is going to be at Blenheim Palace on Thursday hosting Trump—and 100 business leaders are invited to meet him,” he said. “People have said they’re coming to protest from Birmingham, Warwickshire, Gloucester—and even Devon. When we’ve been campaigning, we’ve run out of leaflets because the reaction’s been so strong. Trump is rumoured to be spending time in Scotland. The Scottish TUC union federation has been at the heart of organising protests against him. “The STUC has been working with a wide range of organisations to build protests against Trump that will demonstrate the strength of feeling against him,” a spokesperson told Socialist Worker. “We have been setting the stage for demonstrations on Friday evening in Glasgow and in Edinburgh on Saturday. Many social and political groups are organising transport. Activists in Aberdeen have called a protest at the local Tump International Golf course. The array of demonstrations will deal a blow against Trump and the racists across the world who look to him. There are now so many reasons to protest against Donald Trump it’s difficult to keep track—and Trump added to the list last week. At a rally in the state of Montana last Thursday, his mask slipped and revealed the ugly creature underneath. Trump reiterated his characterisation of Elizabeth Warren, a senator with Native American heritage, as “Pocahontas”. He went on to say he would offer her a million dollars to take a DNA test because he did not believe she was Native American. “She’s based her life on being a minority,” he said in a sickening racist rant. The scandal of migrant children separated from their parents continues. And in a shocking example of the savage cruelty of Trump’s border policy, a guard taunted a mother separated from her child. An immigration cop told Angelica Gonzalez-Garcia, “Happy Mother’s Day” after telling her she would never see her child again. Now they are reunited following a legal battle. But the horror continues for thousands.